Waukeshatony requested that I'd make a red and black version of my male cheerleader outfit. (Sorry for the delay; I meant to have uploaded this sooner.) It shows up in the "Everyday" and "Athletic" categories for both Adult and Young Adult. 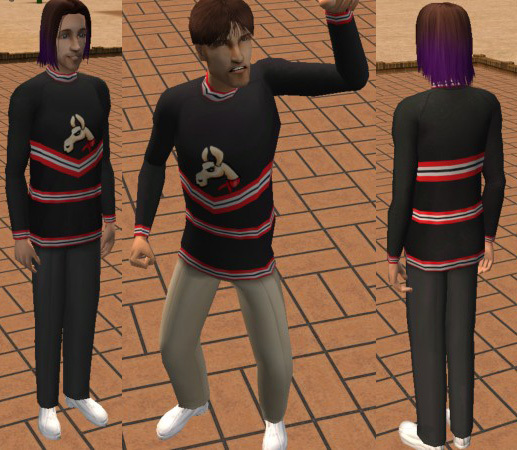 I used my original male cheerleader outfit as a template so it should work fine if that one worked fine. It requires University. I wanted it to be a little more complex in appearence, but I didn't have much time and my efforts didn't turn out as well as I'd like. Edit: In case of any confusion, yes, both versions are included in the zip.